Can I ask a question from a previous thread that is now locked. It maybe that someone can just give me an answer to what I am asking about without reopening the thread. Bascally I am asking about trying to download a Patch for AMD processors before downloading to upgrade to Windows XP SP3..the file is no longer available... from both a website that I was referred to or direct from Microsofts downloads page.. I just wondered if it maybe possible to download it from somewhere else.. It was initially suggested that I downloaded the Patch for AMD processors at this url..
On looking there was two links to download..
then the other link at the top of the page has taken me to a uniblue driver scanner page.. which I am not sure I want to download...and I am not sure what may happen if I do download it..
Then I did another search for any other webpage to download it.. and found Microsofts.. BUT on trying this... and finding a download link for it.... I get a message saying the file is no longer available..
Can anyone advise me if they know of another download option ? Also can I ask, I was also referred to trying eset scanner... and on looking it offers 2 options..
Can I ask if I select the free one time scan... if that is a one time ever ONLY ? or can you use that option again at another time..
rather than taking the other option for a free 30 day trial ? As if it is a ONE time only offer... I may as well take the 30 day trial ! Download Download the Update for Windows XP (KB953356) package now. Now, if you decide to update, make sure that you read this to ensure that your computer is configured to receive updates automatically. Also, as displayed in the Addition.txt log you have an AMD processor. If you do decide to install SP3 you will need to install the patch for AMD processors prior to downloading and installing SP3 which you can find here > Windows XP SP3. IE8 should be offered thereafter through windows updates. I would let it update on it's own though you can click the Windows Update button to check for more. And if I may be completely honest with you, if you do not choose to update your system to SP3 and IE8 there is not much I can do to help you. That is the reason why you are having all the trouble you are having. Keep me informed to the choice you make. Have a nice day/evening, dowsp. On trying to download a Patch for AMD processors before downloading to upgrade to Windows XP SP3..
there is also a link above on the same page but it takes me to another site to ask me to scan 1st..
but I assume then it will still take me to the same site that I have already tried. 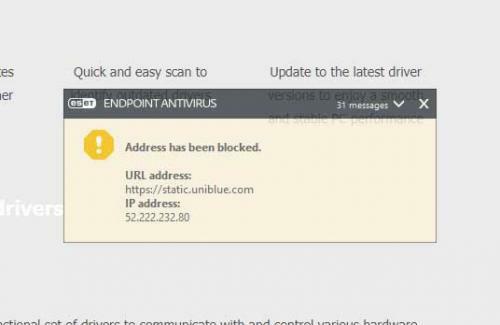 Fast, quick and easy, DriverScanner boosts computer performance by scanning for, downloading and then installing updates for all your device drivers. Edited by dowsp, 11 December 2017 - 12:22 AM. Choose ESET Online Scanner its free and can be executed every time you want to run a scan, because it doesn't do active protection it can coexist with any other Antivirus. I appreciate your replies and advice Azarl and Sleepy Dude. or .which of the best options to select..
Should I enable detection or disable detection ? I could try one or the other to see what happens, but I am not sure how indepth or how long it may take. No doubt depends upon hard disc usage and size..and how deep a scan you may do.. such as root kits.. I think by enabling.. that will allow the scan to highlight and list any malware and then allow the option to delete it at the end. BUT if I opt to Disable detection.. I am not really sure what will happen..is it just a case that it will not show any files during the scan.. and maybe is what you would use if you ask the scan to auto delete any detections...but there is also an advanced selection to do that..
Then there are some advanced options one can select.. Although the link below gives some information... Some of the options offered I am still uncertain about.. I assume that the Proxy option if one does not want to use ones own ISP , but I am not sure if there maybe a recommended Proxy or if I need to find one to use ? or if you think that is maybe the better option ? Edited by dowsp, 12 December 2017 - 02:37 AM. If you suspect the computer is infected then its not good idea to install the SP3 because most likely will fail. Thanks again Sleepy Dude for offering your advice & opinions. I did the scan and it did it quicker than I expected....Maybe about 40 minutes...and it found no viruses or malware..
My computer has certainly not been working too well and either seems to freeze up quite a lot or act slow, especially after some usage or if I have opened several webpages.. or try to scroll on sites like yahoo if say I open a news article. I have also dowloaded the Patch and now the SP3 update.. But on finishing the sp3 update, its asking me to select any update options.. and is asking that I install a CD Windows XP disc.. But it also seemed to suggest it could search for updates.....so I tried to see if it would detct them and download them from a online site. I then tried again and it downloaded something else to do with a modem..
but I am not sure if it has done what was required.My sound had not been working prior to this.. I have since found two CD discs but I am not sure which to install. and the other disc is a Driver and utility Dell Inspiron 1501 disc. It maybe that the attempted online installations may of either failed to download what was required.. or if it has downloaded some relatent files..
maybe its just needs a restart.. I have tried to play a video to listen for sound, but so far it has not seemed to play any sound..
unless also I just need a totally seperate file that is not on the disc..or the site it seemed to attempt a download. Can you post the Dell Service Tag of the machine you have. Just to also let you know.. Since my last prior post.. I think initially maybe it also did an update. then after I restarted the computer... If I recall it seemed to another download of several files..
or I seemed to think it was connected to SP3..
and that also found no malware or viruses. What I have since found ...is am have since been getting numerous further updates...in what seemed quite a short time..
so maybe I had downloaded MB soon after SP3 and my earlier downloads had been MB ones..when I had thought it has been further SP3 ones. I think I recall maybe its advisable to uninstall MB. I thought when I downloaded Malwarebytes that I selected the FREE version, but somehow it installed a free 14 day trial to the premium paid version..which as far as I was aware I never selected.. So I am not sure if I can uninstall a trial version of MBs... or if you may advise me to do so before I do your next step ? or maybe it wont make any difference and maybe I should just do as you suggest.. which maybe thinking about it..may not make much difference or could be done again if need be..
OH, and I will say that on the last attempted further downloads that I think were from Malwarebytes..
it attempted to download about 100 files and this was after it had previously downloaded about 34 files earlier..
but the 100 file download did not manage to complete as it seemed it stopped at about 96 files..
so I ended up having to switch the computer off and on again..
so any list of Last 10 event log may show ref to that..failed attempt to download the 100 files..
Edited by dowsp, 12 December 2017 - 04:02 PM. Please follow what I post on #7 then we can decide on next steps. I chanced doing the next step..
Running from "C:\Documents and Settings\JS\My Documents\Downloads"
Model: 0UW744?????? Manufacturer: Dell Inc. Description: Hanging application firefox.exe, version 52.5.2.6549, hang module hungapp, version 0.0.0.0, hang address 0x00000000. Description: Failed auto update retrieval of third-party root list sequence number from: <http://www.download....uthrootseq.txt>with error: This operation returned because the timeout period expired. %%1053 = The service did not respond to the start or control request in a timely fashion. Description: Timeout (30000 milliseconds) waiting for the Google Update Service (gupdate) service to connect. Description: DCOM got error "%%1053 = The service did not respond to the start or control request in a timely fashion.
" attempting to start the service gupdate with arguments "/comsvc"
Description: http://www.download....rootseq.txtThisoperation returned because the timeout period expired. For some reason when i tried to post a reply, it would not do it.. I think because you had also replied at the same time..
and I am unable to delete the post in full.. Unfortunately as I kept trying to post, its now posted the content several times..
Edited by dowsp, 12 December 2017 - 04:15 PM. Ok, Service Pack 3 is installed that is good. Now you have some drivers missing... How is the computer connected to the internet? Please visit this web page http://www.dell.com/...t/home/us/en/04click on Detect PC and let the page detect the Service Tag to see if it shows a different Tag because the page say that BBCPL2J is an OptiPlex GX620! I use Wifi to connect to the Internet. I am not sure why the tag seems incorrect.. I did however purchase the Laptop 2nd hand from ebay. I was never familiar with what a OptiPlex GX620 was ! .. is it supposed to be another model of Dell laptop..on a quic serch it seems its a PC rather than a laptop on a ebay link I found..
Express Service Code: 24631082731 rather than what the tag showed as being 244-496-482-03. If you believe it unlikely that Dell would take any sort of action or that it is unlikely to flag something..to alert them... then I will probably chance doing it..
Edited by dowsp, 12 December 2017 - 05:55 PM. The is no problem in running that Dell check, they don't care about the Windows you have. Can I ask, would it be possible to do this without knowing the tag number ? I am not sure that I want to have to download something from Dell in order to obtain the tag ? as they require me to agree t something and download a file in order for it to obtain the details somehow. It make me think they would be spying on me..
where as I would had thought really I should have been able to just visit their website in order for it to detect my details..
a bit similar in the way that you can use the eset Anti virus direct from their site rather than have to install it..